2H Offshore has a diverse track record of component detailed design ranging from bolting systems, pin/box stab connections, sea fastening arrangements, ROV tooling, split rings, spider gimbals, auxiliary line friction clamps, subsea jumpers, installation guides and tables, manifold skids, suction piles, riser flange connections, riser pull-tubes, riser crossover adaptors, wellheads, BOPs, TLP tendons, and more. 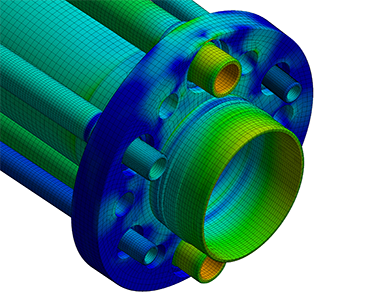 Our engineers come from a variety of disciplines including civil, structural, mechanical, aerospace, and electrical and have extensive experience using finite element analysis (FEA), computational fluid dynamics (CFD) and CAD for the development of offshore components. We use the latest versions of the most popular software simulation packages and are well-versed in interpretation and verification of the output from these tools to demonstrate regulatory compliance. We have conducted detailed engineering and FEA of almost every type of riser connector including flange, union nut, dog and window, clamp, collet, tool joint and T&C type couplings.